Is it possible that one TINY “MILLIMETER” change can lead to BIG success? Wouldn’t it be GREAT if the dreams you yearn to accomplish in your business, professional practice or even relationships and personal health and fitness could be realized in such small, millimeter steps. Wouldn’t you want to know how? • “Millimeter” methods to improve your finances and business and deepen relationships to experience a more joyful, fulfilling life. • How setting goals and making changes to your business or personal life can be accomplished in very small, “millimeter” steps. • Techniques you can use to make “millimeter” changes and SUCCEED. • Through real-life case studies how others have made “millimeter” changes and enjoyed BIG Results. 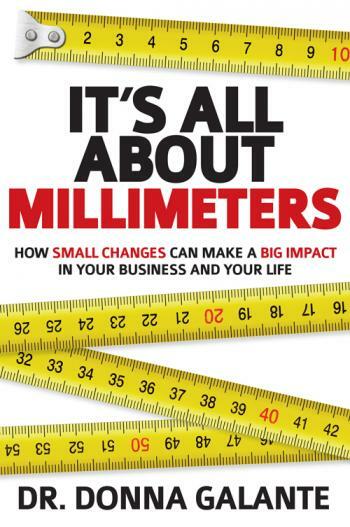 By taking a “millimeter” approach, you can make the changes you need to achieve your business and personal goals. Small changes done consistently will bring about the desired results you have been looking to achieve. As a practicing Orthodontist for over 26 years, Dr. Galante has used “millimeters” as a measure of success in creating healthy and beautiful smiles for her patients. She shares how using a “millimeter” approach to achieving your goals will get you the results you wish to achieve once and for all.